Visible Ink Press : Inspired by the real-life historical figure Guy Fawkes, this hero's identity is never revealed. Inspired by the real-life historical figure Guy Fawkes, this hero's identity is never revealed. He lives in a post-nuclear world where Great Britain has a fascist government. His superpowers come from when he was imprisoned by the fascists, who conducted experiments on him. His secret headquartes is called the Shadow Cabinet. He takes his name from a Roman numeral label on his prison cell door. V for Vendetta, created by writer Alan Moore and artist David Lloyd, is the saga of V, a mysterious costumed vigilante with superhuman physical prowess, who conducts a one-man war against a totalitarian government that rules the United Kingdom. In V for Vendetta's alternate history, there was a nuclear world war in the 1980s; Britain survived, but a fascist political party took control of the government, imprisoning dissidents and other alleged undesirables in concentration camps. Moore and Lloyd never reveal V's true name or face. However, the story establishes that V was a prisoner in one of the British fascist regime's concentration camps, where he was subjected to experiments that greatly enhanced his strength, endurance, and reflexes. He apparently took his alias from the Roman numeral "V" on the door of his room in which he was imprisoned. Each of the chapter titles of V for Vendetta prominently features a word starting with "V."
V masquerades as one of the most famous rebels in British history, Guy Fawkes (1570-1606), complete with an eerily smiling face mask. Fawkes is the best known member of the "Gunpowder Plot," a 1605 conspiracy by a group of English Catholics to assassinate King James I, blow up the House of Lords, and make James's daughter, Princess Elizabeth, the new Catholic queen of England. Fawkes was discovered with gunpowder beneath the House of Lords shortly after midnight on November 5, 1605, and was sentenced to be executed. Ever since then, the British have celebrated the thwarting of the Gunpowder Plot on every November 5, which has become known as "Guy Fawkes Night." These celebrations traditionally include fireworks and the burning of a masked effigy of Fawkes in a bonfire. However, William Harrison Ainsworth's 1841 novel Guy Fawkes; or, The Gunpowder Treason recast Fawkes as a sympathetic antihero, and Fawkes thereafter became a hero in serials in "penny dreadfuls" and children's books. 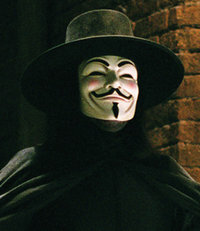 Moore, via V, uses Fawkes as a symbol of rebellion against authoritarian rule. V is an anarchist who commits assassinations to punish his oppressors from the concentration camp, and stages highly theatrical acts of sabotage in order to induce the British populace to rise in revolution and overthrow their fascist rulers. The other leading character of V for Vendetta is Evey Hammond, a young woman whom V rescues from fascist policemen on November 5, 1997. After blowing up the Houses of Parliament, V takes Evey to live at his secret headquarters, the Shadow Cabinet, and she eventually becomes his protégé: and heir. V for Vendetta debuted in Warrior #1 (March 1982), a black-and-white comics anthology magazine that was published in the United Kingdom by Quality Communications. (This is a different company than the 1940s American publisher that was known as Quality Comics.) Alan Moore's version of Marvelman (later called Miracleman) premiered in the same issue. Quality canceled Warrior in 1985, before the V for Vendetta serial was finished. America's DC Comics then signed Moore and Lloyd to complete the story. DC began publishing a ten-issue V for Vendetta series in 1988, first reprinting the Warrior episodes in color, and then running the new material that brought the story to its conclusion. DC then repackaged the series in graphic novel format, and this version has remained in print into the present. In co-creating and writing V for Vendetta, Moore has stated that he drew on many influences, including Batman, the Shadow, Robin Hood, the Marvel UK superhero Night Raven, works by George Orwell (1984), Aldous Huxley (Brave New World), and Harlan Ellison ("'Repent, Harlequin!' Said the Ticktockman," about a trickster rebel), the television series The Prisoner, and even Vincent Price's revenge thriller films, The Abominable Dr. Phibes and Theatre of Blood. In 2008, Warner Bros. released a feature film adaptation of V for Vendetta, that was directed by James McTeigue, and written by Andy and Larry Wachowski, the brothers who are best known as the writers and directors of The Matrix movie trilogy. Hugo Weaving played V and Natalie Portman played Evey. Other major roles were played by Stephen Rea, John Hurt, and Stephen Fry.